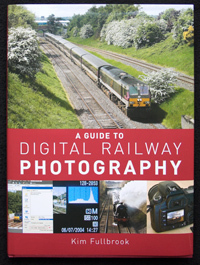 The book is a guide to digital photography written by the author specifically for railway photographers. Illustrated throughout using railway examples, it covers all the techniques needed to successfully capture and process digital photographs. It will be of interest to any railway photographer using a digital camera, whether beginner or experienced. The principles and techniques described can be applied to other transport subjects such as buses, cars, planes and boats, as well as to general landscape photography. The examples are illustrated using images of railway subjects mainly in the UK but the techniques are applicable to railways anywhere in the world. The content covers the technical aspects of photography, both when taking pictures and processing them on a computer, rather than more subjective areas like composition. The book is based on the articles published in Railways Illustrated magazine from 2004 to 2008, brought up to date and with much new material added. Scanning film into digital format is a major subject in its own right and is too large to include in this book. However, although the editing techniques are based around images from a digital camera the same principles can be applied to images scanned from film. Some photographs of the book are shown below. Click on any page to display a high resolution version. A list of Chapters and subjects explained in the book can be found here. The book can be purchased from the Ian Allan web site and other railway book suppliers.